Does anyone remember this magazine from around 10 years ago? Personal Journaling: Writing About Your Life was put out by F&W Publications, who also publish Writer’s Digest magazine. From what I could find, it ran from around 1999 to 2003. There was a dedicated website, but it’s long gone. You can still find many of the articles on the Writer’s Digest website tagged with “journal” though. I have six issues from 2002 and 2003. They’re tired, dog-eared and yellowed with age, but still a very active part of my personal journaling library. Each issue covered a range of journaling related topics – such as writing a journal entry as a letter, or using journal writing to help with changing careers, or how to create a journal group. Other topics included family history journals, couple journals, journal prompts and an awesome article entitled “20 Ways to Fill Page One”. The August 2003 issue has a spotlight article on the 1000 Journal Project. It was a great little magazine, but I guess the niche topic was too small to keep it in print. I was sad when it was no longer available on the newsstand here. Luckily nowadays there are so many journaling related websites and blogs to fill the niche. I was just curious if anyone else remembered the magazine? This entry was posted in Journaling and tagged Journaling by Sammie. Bookmark the permalink. I love it and remember it fondly. I havent found mine since I moved, but I know they are in a box somewhere. Mine have been stored in boxes from time to time and during various moves – but they always end up back on the shelf eventually (usually when I’m in a bit of a journaling slump and need a little inspiration to get writing again). It’s just a shame they were printed on that cheap newspaper type paper that yellows so badly. Happy Journaling! are you selling them? I am looking for more of those magazine. let me know. I regret not knowing about this magazine earlier. I just have one. Sorry, I’m not looking to sell them. They’re too precious as part of my journaling library! You can still read many of the articles online at the link mentioned in the post though. I just found my copy of December 2002. I am so sad that I can not order this magazine. I had this copy stashed away in a drawer by my recliner. Why I did not use it I will never know but now I really would like to have other copies. Maybe if I on e-bay maybe some one will be selling a copy. I have been journaling off and on since my husband died. Now I see the real value of doing so. Also want to start a spiritual journal but don’t quite know how to go about it. Do you have any ideas? I remember “Personal Journaling” very well, and I miss it, too! My copies (about 10 or so) have also been pored over- and used for journaling workshops I’ve taught. I remember suggesting that Writers’ Digest continue it in a “half-size” format, to match the size of most journal notebooks. They really should resurrect this title, as there are no other journaling-specific periodicals. Also, I think journal-writers like us prefer paper-based publications. You’re so lucky to have your old copies, I miss mine! A half size format would be perfect, mini magazines are so cute and portable. There is a new journaling magazine out on kindle, and I hope that helps encourage the old magazine to consider coming back out. Soooo many people are into writing these days, they could fins huge success with a print magazine this century. Journaling has never seemed as popular as it is now. I just came online to search for a subscription site and found yours! Thanks for all the great info on content that is still available. I do remember it! I used to have a column called Sketchbook, unfortunately only a few issues before it folded. I just found one of the issues this week and have been devouring it. Such a great magazine…and what a loss. Now that journaling is huge again, I wish there were something to take its place. 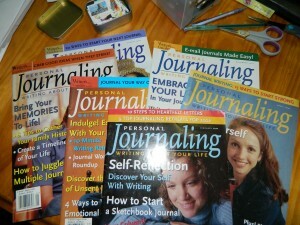 I still have all my “Personal Journaling” magazines. I keep them in my bookcase and I still read them. I wish so much that they would bring them back. I don’t think there will ever be another magazine as good as this magazine. I have a number of them. I don’t think I have them all, though. I wish a magazine like this was published consistently…..online or in print. I LOVE my copies. And, like some of you remarked, they’re messy, dog-eared, and well-read!!!! I remember it as well. There are times, like tonight, when I have an urge to see if maybe they are printing a new one. Not enough is written on writing for yourself. There is a new journaling magazine on kindle, different publisher but helps fill the void. I’ve missed the old magazine for over a decade and nearly fell over when I stumbled on the new journaling magazine in kindle library. Yes I remember this. Wish we had this resource again. I read so few magazines and would welcome something like this, maybe structured as a mini-curriculum for serious journal writers who wanted to form groups. I remember them fondly, too. I wonder if it would be possible to scan them and share? Sounds like Writer’s Digest might hold the copyright. It would be a fun product to bring it back in anthology form. Such a great idea! I look online every once in awhile. Longing for an anthology! You could do a YouTube flip through of the magazine pages, most people who do flip throughs of scrapbooks, magazines, etc. haven’t had copyright claims against them. Or a private Flickr/etc. group showing some of the pages, given credit to the publisher. Oh, I wish this magazine still existed! Found some old copies at the library and searched for how to subscribe and found here. Is there a way to backorder old Personal Journaling Magazine issues? I’d love copies of their entire run… maybe they could do a batch run as a gift box set and sell? I would buy one in a second!! There’s a new personal journaling magazine coming out at least!! It’s on Amazon and is called The Journal CEO Magazine. It comes out this weekend, I haven’t read it yet, but the sneak peaks they did are cute. Not sure if it’ll be similar to the old Personal Journaling Magazine or not. It’s on Kindle and in print, I preordered the Kindle edition and am hoping it’s a little like the old journaling magazine. I miss this magazine so much! I landed on your site trying to find old copies to buy. There is a new journaling magaizne now I found on kindle, the journal ceo magazine. It’s a new personal journaling magazine and I squealed at work after stumbling on it in the kindle journaling section. I remember it. I had an article published in it sometime around 2002 or 2003. But I can’t remember when and I lost my copy. Bummer. It was a good mag.